One of my resolutions for my job this year is to incorporate more stations during my Pre-K program and my story time theme weeks. I was excited to do this for first theme of the year, snow. But alas, nature decided to step in and be ironic. Not many patrons came into the library this week... because it snowed. But, it turned out alright. At my library we in the Youth Services department plan our theme weeks ahead of time. A month ago a coworker planned a "Snow" theme this week. As it so happened, as often it does in Indiana, we got actual snow dumped on us. This made our programs this week a little sparse. This included my Pre-K Explorers where I got a whopping total of 0 for the program. All because of snow! It was also -30 with the windchill so I guess I cannot blame it 100% on the white stuff. Nevertheless, the show must go on. 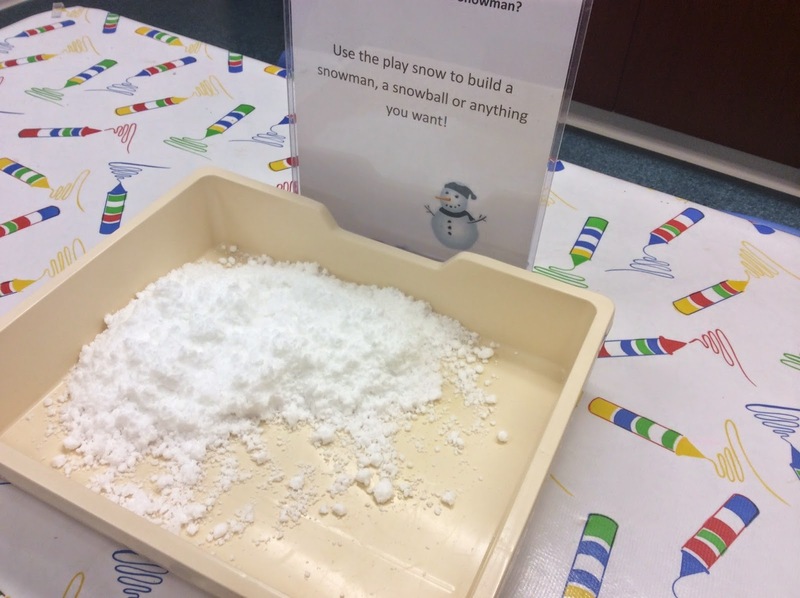 So, for snow story time today I used a few activities I had set out for my Pre-K group, and it worked out very well. Station 1: First up, a fake snow sensory station! Thank you Pinterest! This recipe is simple, simple, simple. At first I did not think it was going to work but it did! I had one of my coworkers playing with it for a good 15mins while we were having a meeting. 3 cups baking soda + 1/2 cup WHITE conditioner. BOOM! You have fake snow. And somehow it's even slightly cold to the touch. If you want to make it a day ahead of time make sure to put it in a large plastic bag so it does not dry out. Station 2: My second station was all about counting. I plan on replicating it in future weeks when appropriate. I had a bowl full of "snowballs" () in the middle along with tweezers for helping with fine motor skills. Then I place 5 sheets with numbers and dots on them. 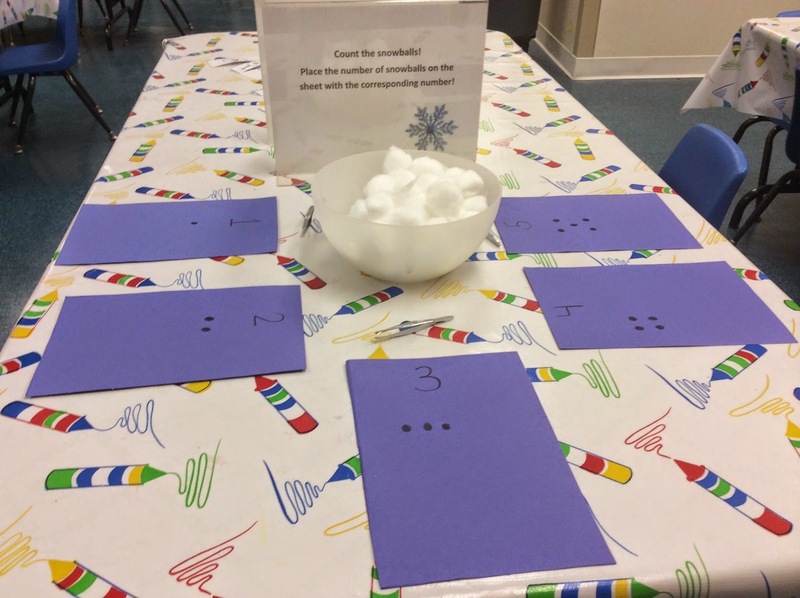 The directions on the sign told users to use the tweezers to place the corresponding number of snowballs on the various sheets of paper. I did come across a mom helping her little one to do just this and it made me smile! Station 3: The last station had our little ones working on their letters and the alphabet! 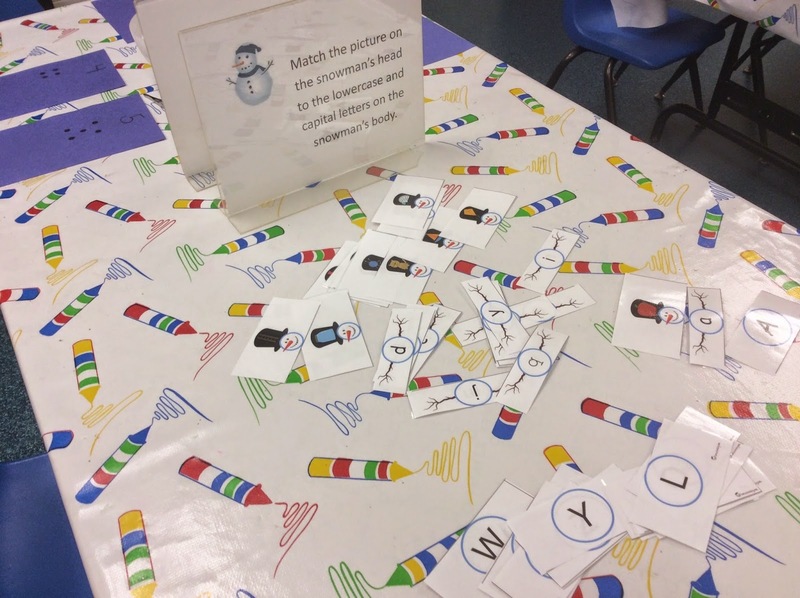 This task involved matching up three different parts of a snowman. The head had a picture on it representing a letter, (ex: apple). 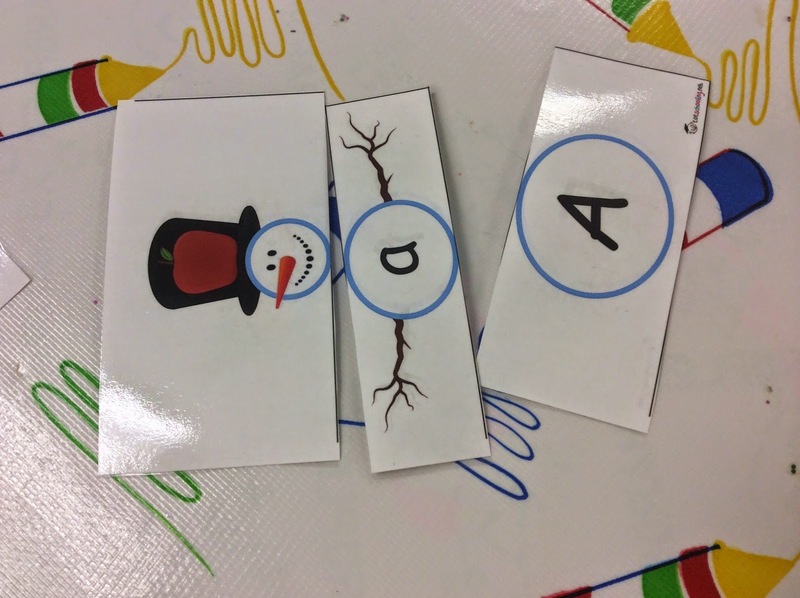 The task was then to match the picture to the capital and lowercase letters on the bottom pieces of the snowmen. Even though we had frigid temps and snow the kids really did enjoy the theme. They were very enthusiastic about telling me how they played outside in the snow and how much snow was at their houses!